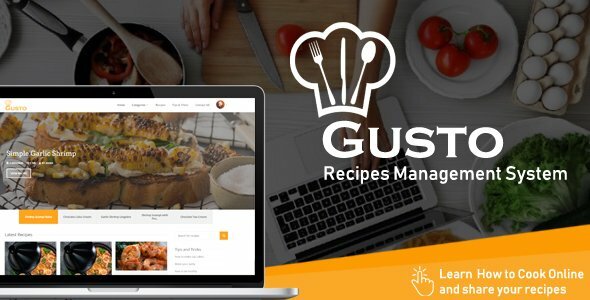 Gusto is a powerful platform to manage recipes for food specific websites. It comes with a plethora of features that make managing the system super easy. Users can register accounts and create their own recipes or you can use the application to manage your own and share them with your friends. The web application is a great way to build your website, very simple to install and customize and we offer great support, That don't require and experience on web development. Take a look at this wonderful script and you will be impressed even more! Enjoy! 1- New Feature: Custom Print Option for recipe. 2- Latest tricks and most visited tricks widgets for trick page. 3- adding text editor for tricks module. 4- Using DISQUS to comment and react for trick post and recipe. 1- Delete Confirmation for each module records. 2- Dynamic SMTP User for forget password email. --You can check documentation to show how to install it. 1- Fixing Security Issue at Ads module. 1- Fixing Bug at Ads module. 1- Update UX for home page. 2- Add advanced search for home page. 1- Pagination in admin panel modules. 2- Filter for appearance table of users that having 2 pages for admins and normal users in admin panel. 3- Admin/ normal user can set their email appear in their profile.